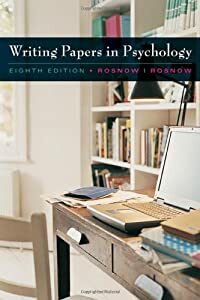 WRITING PAPERS IN PSYCHOLOGY offers you frameworks, tips, guidelines, and sample illustrations for writing research reports or literature reviews that must conform to style recommendations of the American Psychological Association. It also is designed to cultivate your organizing, literature retrieval, critical reasoning, and communication skills under deadlines. For more than a decade, this brief, inexpensive, and easy-to-use manual has helped thousands of students in psychology and related fields with the task of writing term papers and reports.